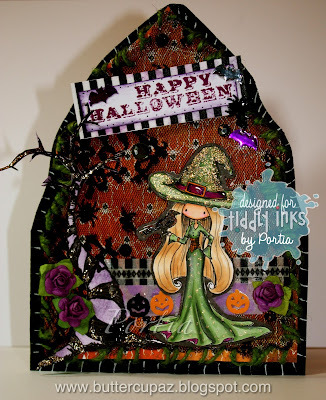 Strawberry Road: Fabby Friday Arch Card with Alison the Witch! Hello Craft Enthusiasts! Hello Lovers of Hand-made cards and the like! Thank You for stopping by today!!! Happy Fabby Friday with Tiddly Inks! Alison the Witch. You've heard about her. She's a gentle soul but seems to possess supernatural powers. She communicates with birds. She has some sort of charm no one can resist. If you ask me, she's a good witch, Alison. Alison the Witch! In the above card, she can be seen communicating with a bird as she hovers near a Twisted Tree. If there were to be a movie about her, I imagine Nicole Kidman would play her, at least in my version. And the bird would be played by Johnny Depp…or Kevin Spacey..or maybe even Rylan Clark. I wish you a wonderful FALL Season, whether or not you celebrate Halloween! I hope you give yourself permission to DRESS UP whenever you feel like it, even if it's just for fun! Feel free to join in the Tiddly Ink's Challenges here! Thank You for stopping by guys & ghouls!!! Fabulous card! I love the shape of it and the background is cool.